Via M of A: The reported neighborhoods of this reported chemical attack in the Damascus Al-Ghouta area are: Hammuriyah, Irbin, Saqba, Kafr Batna, Mudamiyah, Harasta, Zamalka and Ain Terma. Those are rebel-held areas and have been all this year. The map is accompanied by this record of activist reports. McMahon identifies the two UMLACA sites in Ein Tarma neighboring Zamalka from videos of the UN visit. The location of UMLACA #197 was earlier fond by Brown Moses. "The front of Ain Tarma and Jobar in Eastern Ghouta was bombarded with chemical weapons. We noted the incident early, thankfully. We put ourselves on the highest alert." He seems to treat Jobar and "Ain Tarma" medical points as almost one unit, with him taking over management in Ain Tarma (meaning that, or Zamalka?) at some point. But looking at the map, there should be no shared Jobar-Ain Tarma front - they don't touch. He might be using different definitions, including Zamalka and Ain Tarma under the one name, but he also mentions other medical points he didn't run: one was in Zamalka, which he does have a name for. The others he names were in Douma and Deir al-Asafir. Statement says the casualties in Jobar were "massive." He gives no total numbers but he alone handled 50 dead children (VDC lists 117 children dead in the whole attack). If this is true, it's an important clue. "We exhausted our supplies of atropine and hydrocortisone in Jobar." 200 oxygen cylinders, 25,000 ampules of Atropine, 7,000 ampules of hydrocortisone, 35,000 syringes, all "from our Jobar warehouse alone," some of it taken to "Ain Tarma." Altogether he says "we exhausted our supplies of Atropine and Hydrocortisone." How many ampules per victim is usual ... not sure. ... depends how you split it between those who need a bit and those you dump ten into before they die anyway... 25,000 sounds grossly exaggerated, to me. This story has video of the Zamalka "dead cats and dogs zone", including video from the Zamalka ghost house. 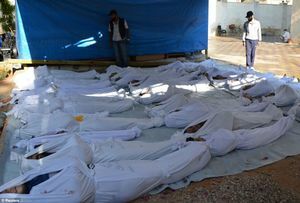 "We expect the number (of deaths) to grow because we just Zamalka to discover a neighborhood where houses full of dead people," said the spokesman of the opposition Syrian National Coalition, Khaled Saleh was quoted by the Arab network Al Arabiya. Lucum has done some extremely good work at his Eskimo blog. First, he has located videos of the "burial of more than 80 martyrs as a result of the massacre" on July 1, 2012. These older mass graves are in fact visible on the default Google Earth image. He calculates that at most 40 victims could have been buried in the August 21, 2013 mass grave. He has also found a VDC video uploaded August 21 from the grave site. It shows a book with the names of 149 victims. The names are written on a blank calender or diary for the year 2007. The names start on the page for Saturday, August 21, 2007 and go on for several pages. It does not seem possible, that the people recorded were buried at this site. Now stated to be in Zamalka, see Talk:Alleged Chemical Attack, August 21, 2013/Zamalka ghost house#Planted bodies? The two-stairwell building is special for the large number of windows between the stairwells: six. At first I thought this would be on the southwestern edge of Zamalka, looking east, but based on the location of the UMLACA impacts published by HRW, I decided it was most likely on the eastern side, looking west. I have not had time to look or even check you match on Google Earth. There are few good photos on Google Earth looking west – in fact only one and it is awfully dark. I find this a likely match. There are three rooms (apartments) between the stairwells, each with a window and some kind of balcony. The ghost house would be the 4 1/2 story building 250 meters to the west (both figures exact, here on Google Maps). Both these buildings do not show up in the March 3, 2010 satellite photo, but construction is well under way on May 5, 2011. It is likely that ate least one of the sites would be left unfinished because of the crisis and war. I think I am able to identify three of the higher buildings in between. The west-facing courtyard in front of the ghost house is a good match. Plot thickens... Are you saying this is the time to use theatrical props, like smoke generators, pyrotechnics and sarin dispensers? - ?? The larges collection of victims is seen in the videos from the Kafr Batna Coordinating Committee. The two earliest videos show nighttime outside scenes, with people in panic. The location is a hospital, possibly a temporary field hospital set up in a school or other public building. The large number of victims (100+) indicates that place could in fact be in Zamalka, with its reported 340 victims and not in Kafr Batna. Wikimapia shows an Al-Fateh Hospital in Kafr Batna. 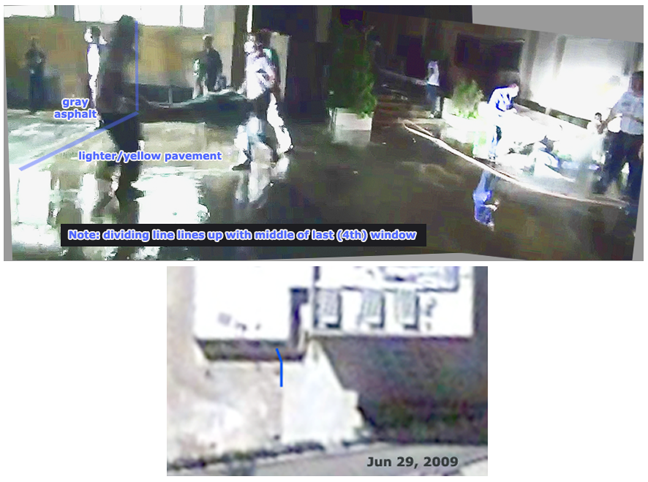 Rebel videos from September 2012 show a fire at the hospital: FNN Syria Kafar Batna Regime thugs are burning al Fateh hospital 1 9 2012 (2, 3). This is not the place with the CW victims. The hospital is separated from a street by a stone-pawed courtyard. Between the courtyard and the street is a fence with ball-topped pillars. Inside the fence is a narrow strip of vegetation behind a low retaining wall. (This video of a similar fence in an unrelated hospital hints that the fence could be facing south.) We see two cars passing on the street from right to left. On the opposite side of the street are some multi-story buildings. Outside the fence grow some tall trees. The daytime view from the window shows the sun shining on the upper floors of the buildings across the street, indicating that the windows are in a northerly direction. So I am just really confused as to first, your process, and second your conclusion. I still don't see how you can start with that view into the glare through the SM window and come up with a location, or even a compass direction. I think with Pope JPII scoring a sainthood today, you should be next in line with a miracle like that. I thought I could correlate everything, but the lights swithching (upstairs on, downstairs off) within a few seconds was clearly odd... I've figured out the video scene correctly now, I think, and I'm 97% certain you did get the right place. Awesome! Considering both corners, a turn at 0:26 in the longer video helping to show the stairs run parrallel to the ramp, it correlated like this (now rotated roughly to what you're seeing as north). Wow, what an amazing effort. One point of disagreement I have with the graphic above is the approach to the main entrance of the SM. You show stairs leading into the main entrance of the SM and at 90 degrees to the door. Reviewing Vid031 at 00:21-0030, I don't see any stairs. It looks like one wheel-chair ramp w/ the white wall, and another steeper ramp that Mr. Minnie is walking on – see at 00:24. Those ramps are parallel to each other but I don't think they are orthogonal to the SM doorway. It's hard to judge that angle of the ramps to the doorway from the vids. It's irrelevant as to my diagrams b/c I don't include any stairs, ramps etc. 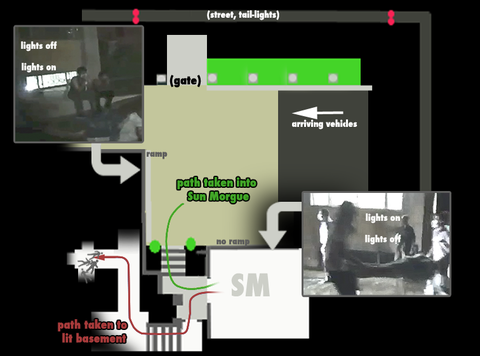 leading from the street to the SM, but it might be important in identifying the bldg on GE. CL, I'm coming around to your view of steps not ramp, which, of course, makes more sense. (Steep ramp for para-olympics -- very funny.) But I can't get a good lightened view. And I can't see any steps in the shadow on the wall. I'll yield to your better reasoned view on this. Still don't see a 90 degree angle into the door. It's almost up the stairs (!) and straight in. Another point, which I don't disagree on but just don't know, is the path out of the SM to the DM, marked in red above. I agree with the first turn to the L just outside the SM door, that's obvious. Because the next section of the vid is in total darkness I put the stairwell to the DM in a straight line along the bearing Mr. Minnie was walking after he took that first L turn. But you have another turn, one to the R just at the top of the stairs. How do you get that turn? When the stairwell light first comes into view at 01:11 it appears in the upper L corner of the screen and moves across the screen from L to R, which would be consistent w/ Mr. Minnie turning to his L at the top of the stairs. So with respect to my Fig. B-1, your version has rotated the DM area by turning the area so the arrow marked "Down" points to the R. I'm wondering whether the DM part ought not be rotated the opposite direction so that the arrow points to the L.
@CL: He's been over it a lot and had better not be wrong. The dispute will/would be/shouldn't be ( ;) ) one or two windows between? Two. left (#3) panned over at the apparent gunshot noise, mark in lower left corner (no outlet) SM-a 0:19 see the guy laying closest to the wall filling most of the span beneath this window. right #2) leaning out, mark just below the ridow, right of center. SM-a 0:24 a different guy fills this span. M-015's blood line is in this span, at that guy's foot level. Sightlines from the SM window: In trying to get on board with the idea that Petri’s building is the KB complex, I’ve gone back to his starting point, which I believe was the image way up above looking out of Window #1 of the SunMorgue, and I have analyzed the b’geesus out of it. I think there’s something here for everyone -- beliebers and non-beliebers. Forgive me if you’ve already gone through this exercise. 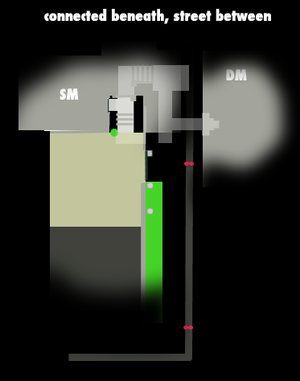 Fig.1 is part of Petri's starting point image blown up and with some sighting lines added. I’ll come back to the lines. The glare is too intense to see the sky well, but you can see some blue and clouds in the upper R corner and just a bit in the upper L corner. The vegetation that can be seen is sparse – a couple scrawny trees and a bush or tree through which the sky can be seen. Look closely at G1 and you’ll see that it is an odd-ball. The globe is displaced to the R (east) on the post, almost to the edge. The other globes are centered on their posts. Figs 2 & 3 show the same fence pillars/globes during the dark of the morning prior to when Fig. 1 was taken. In Fig 2 the displaced globe, G1, is clearly seen. Between the two night time vids, all of the globes can be seen, and it is the only one biased to the R, so it serves as a reference. The other night time video, Fig 3, is not as clear, but odd-ball G2 can still be seen. More important, the guy in the blue shirt is standing on the line that demarcates the asphalt and sidewalk. That line has already been used by CL to line up SM Window #1, as seen immediately above. That asphalt line runs from the west end of Window #1 to just to the right (east) of G1. This can be seen in Fig. 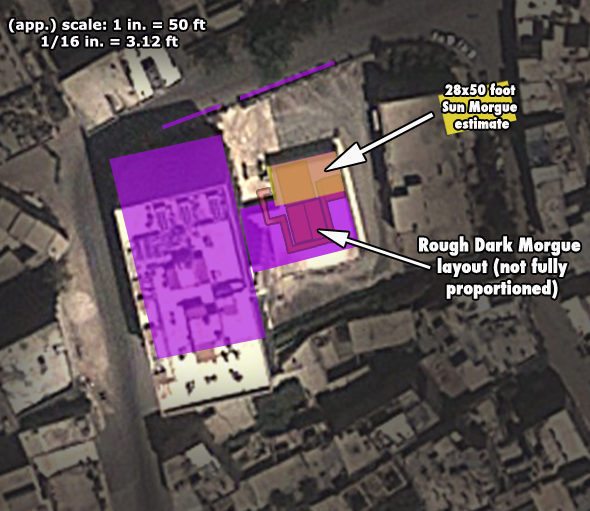 4, which is a GE shot of Petri’s bldg almost exactly a year prior to the Ghouta Massacre. The point that it’s almost exactly a year later means that one would expect the vegetation to be in the same state. But the amazing thing about the satellite shot is that you can actually see the freakin’ globes on that fence. You can’t see the wrought iron, of course, but you can see the globes. This in itself is pretty strong evidence that we’re looking at the same place in the videos and the GE shots. But there is a discrepancy. 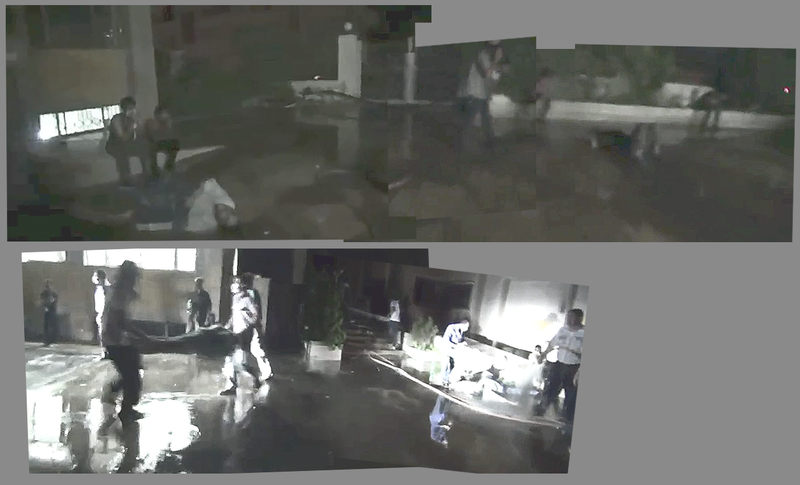 A number of bodies are shown in nighttime shots placed on the pavement of what seems to be a school yard. The same scene is seen in daytime on this video of an agitated Salafist making a speech. There is graffiti on the school walls that has been painted over. The school gate is seen on the video as is some of the surroundings, including an electricity pole right outside the gate. Moved images from section #Unidentified photos below. Gray Brick Morgue(s) A B C - may be 1, 2, or possibly 3 places. The main one seen a lot is said to be in Douma and contains probably 100+ men, women, and especially children. Many cross over with WhiteMorgue victims, some with H. pool, noticed so far. 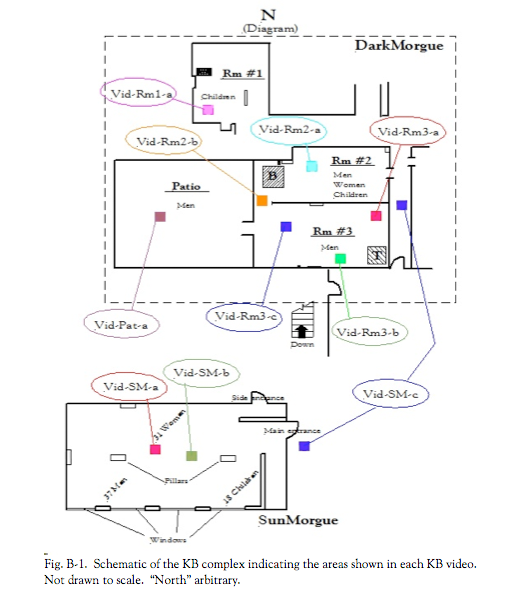 SunMorgue, Kafr Batna, old Tuberculosis hospital - app. 86 victims at one time (rep: app. 100, 125, 150) - no one verified as seen elsewhere (most are seen laid around dawn and still there in the PM, so morning scenes elsewhere should yield no matches. Afternoon ones might). Moadamiyah - any morgue video? Photos suggest a real scene with distinct number 78-88 - many individual photos exist, I consider this credible. Due to isolation, if these bodies were really in Moadamiya, they'll stay there or maybe Daraya, nowhere else in the scenes syudied. Whatever the real tally, it should be added straight out. Irbeen: 63 reported, with a visual spread seeming pretty close to that. Breakdown given and seeming about right: 30 children, 16 women, 17 men. Irbeen mosque wrapped bodies - unless shown otherwise, should be presumed as the same batch. others? No worries about crossover, just distinct places and arrangements. 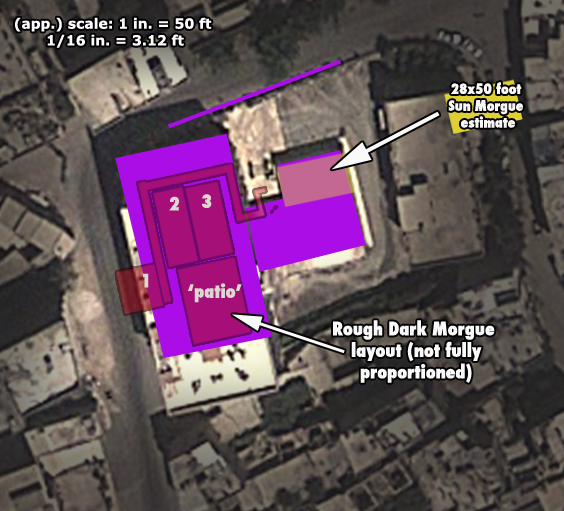 Is this the morgue where the Liwa al Islam truck delivered the dead child? Felim McMahon says this could be in Douma, as does Reuters via RT. http://www.youtube.com/watch?v=bKJgPk1gfk8 – Children brought in on pickup truck. As best I can tell listening he says 'West of Damascus' and somthing like 'Moadimiyah' so I'm assuming it is Moadimiyah. This page was last edited on 9 August 2016, at 08:29.